eHealth Consortium is pleased to announce a free quarterly seminar series in 2013 for members and the public, with the aims to boost the awareness of ehealth adoption for improved care delivery. 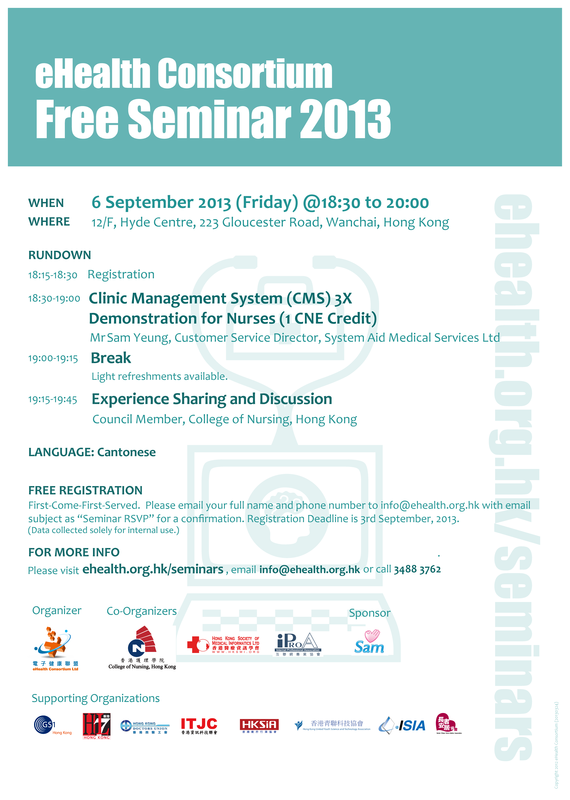 Free training courses focused on CMS 3.0 Demonstration will be provided for Healthcare professionals, as for a better preparation of the implementation of eHR sharing system in Hong Kong. System Aid Medical Services (SAM) provides holistic IT services to Hong Kong private doctors, by providing standards, hardware, software and mobility, to achieve information accuracy, speed, and safety. He is responsible for the Customer Service team including the operation of the training centre. The training centre is dedicated to Clinic Management System (CMS) training for clinics personnel, is going to contribute among other means, to addressing the aggravating shortage of clinic support staff in the private sector. With more than 15 years working in the IT industry, he is also experienced in managing sizable IT operation and IT staff in various multinational corporations in finance services, real estate and manufacturing industries. As a start, he worked as a software developer in Hospital Authority. At the peak of his IT management capacity, he supported over 100 servers and 700 Hong Kong/China users to deliver an IT service and training, resulting in satisfactory and cost effective service level.� His previous employers includes Toppan Group, carrying the title of Head of Research and Development and I.T, Midas Printing Group & Chuang's Group, carrying the title of General Manager - I.T, Bookcity Dotcom, Hong Kong Baptist Hospital, and Y&A Professional Services. Sam graduated from the Computer Science Department of the Chinese University of Hong Kong in 1996 and attained his Master of Business degree from the Hong Kong Polytechnic University in 2005. He is also an active member of Hong Kong Information Technology Joint Council (ITJC) and Internet Professional Association (iProA). He was the members of Organizing Committee of HK IT Sector Gala Dinner in Celebration of the 64th Anniversary of the National Day of PRC too. Discussion and experience sharing focus on eHealth and healthcare aspects, including application of Clinic Management System and other clinical systems, auditing and maintaining information security in the healthcare environment, basic clinical information set up (Such as Patient Records, Stocks and Appointments) and how to support doctors through eHealth applications. The College of Nursing, Hong Kong began as the Hong Kong Nurses Association in 1964, is an organization of nurses committed to professional excellence in nursing for the benefit of the health of the community. It promotes the highest possible standards of professional nursing endeavor by: identifying and examining issues relevant to nursing practice and the health of the community; initiating and supporting research to seek solutions to nursing and health related problem; taking action on issues of significance to nursing and the health of community in genera; promoting and facilitating professional development in areas of clinical practice, management and education; disseminating information on issues of significance to nursing and health; advising and contributing to the formulation and implementation of nursing and health related policies; providing an advisory and consultative service to Government and other bodies on nursing and health related matters; promoting local and international links with nursing and other professional and educational establishments; securing the widest possible representation of the nursing profession in order to increase the effectiveness of its service to members and the profession. Priority will be given to Healthcare Practitioners. Deadline for registration is 3 September 2013.
eHealth Consortium is pleased to announce a quarterly seminar series in 2013 for members and the public, with the aims to boost the awareness of ehealth adoption for improved care delivery. (Updated on 09 August 2013) Stay tuned for information on our next seminar!